CHICKEN: First, marinate the chicken. Combine first 9 ingredients in a small zipper-top bag and mix well. Add the chicken cubes, seal the bag and marinate in the refrigerator 1 hour. QUINOA AND BLACK BEANS: Meanwhile, prepare the quinoa. Bring water or broth to a boil. Add the scallion, lime zest, garlic, salt, black pepper and quinoa. Simmer uncovered until water is almost absorbed (about 15 minutes) and the germ begins to appear. Remove from heat, cover and let stand 12-15 minutes. While the quinoa is standing, prepare the black beans. Heat oil over medium-high heat in a small skillet or saucepan. Add the onion then reduce heat to medium and cook 3-4 minutes or until beginning to soften. Add the red bell pepper and continue cooking 4-5 minutes. Add the garlic, chili powder, ground cumin and stir briefly. Add the beans and the chicken broth. Bring to a boil then reduce heat to medium-low and simmer approximately 5 minutes or until thickened. Keep warm. FINISH CHICKEN: Remove chicken from marinade; reserve marinade. Heat a non-stick skillet over medium-high heat. Add the chicken cubes and brown well on all sides. Pour marinade into the pan along with ½ cup chicken broth. Bring to a boil, reduce heat to medium-low and simmer 5-8 minutes or until chicken is cooked through. 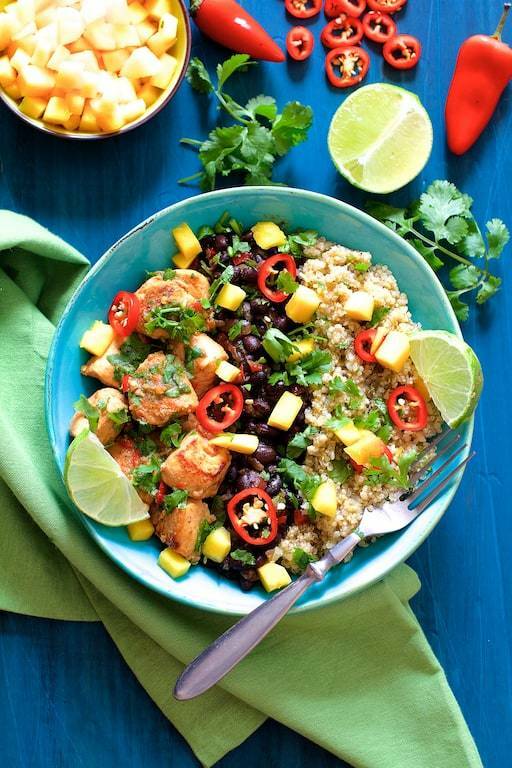 TO SERVE: Divide chicken, beans and quinoa evenly between two bowls. Top with chopped fresh cilantro, mango, sliced chiles and lime wedges.